As Steve McGarrett used to say every Sunday night – ‘Book ’em Danno’. I never got booked once but man alive did I want to be rowing a sea kayak into the waves every sunday evening. Back from Boulder – what a great place. Full of fit people, never saw anyone smoking and only 5 police cars in 5 days. One of those was a sharp-eyed cop that noticed a mother and baby crossing the road had dropped a little pink bootie so he pulled up, flicked his lights on, jumped out, grabbed the bootie and handed it back to mumsie – all very nice and polite like. Now, compare that to Ft Lauderdale where every couple of seconds, the five – 0 are passing you on the street and you begin to wonder how sweet a spot you are in. A shed load of photos have just been uploaded, you will find them in an album in the photo section called ‘Boulder, Colorado’ strangely enough – took a lot of thought that one. Is it just me that has the new Taylor Swift song spinning in my head or is everyone buzzing with it? The players gonna play play play play play play and the haters gonna hate hate hate hate hate hate – you get the drift. I am finding it so catchy that I might just have to buy the damn album, but please don’t tell any of my friends. In just 33 days, I will be back on European soil and staying there for a few months too – I am looking forward to that, especially the winter, after chasing the sun for the last 6 months. We were lucky enough to get a flurry of snow in Boulder to prepare me for the euro winter that lies ahead. I can hardly wait. I want snow !! So on the final countdown (it’s all song references tonight) but I will be back soon, keep one eye for looking over your shoulder. 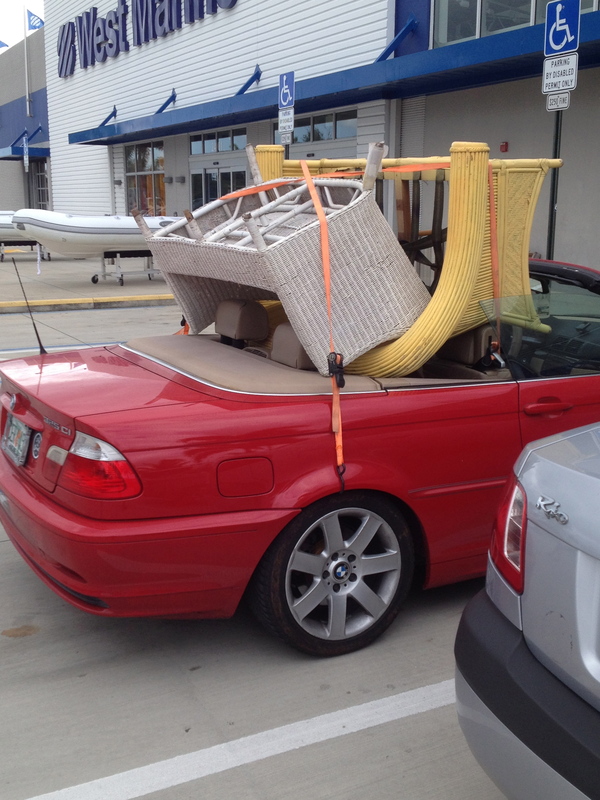 I thought I would leave you tonight with a picture I took of some chicks BMW at the local boat supply store yesterday afternoon, just made me laugh when I saw the hook of the luggage strap grabbing at the wheel arch and then onto the seat belt points on the seat back – priceless! Doing everything she can to get women drivers a bad name !